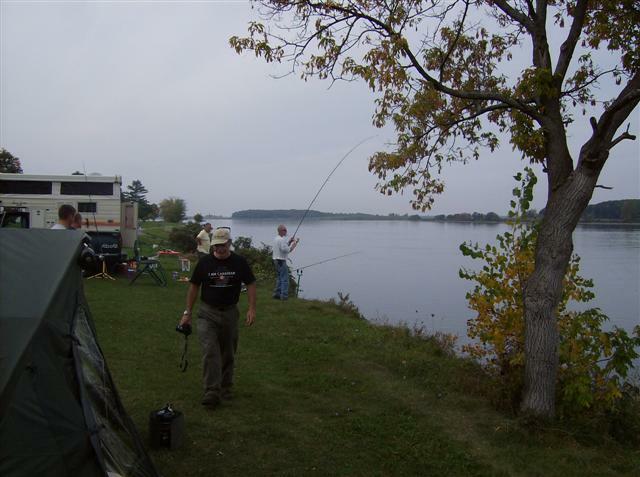 Early this year in March, Lorne Morley (aka Hammercarp) - the Ontario provincial chair for the Carp Anglers Group - contacted me and asked me if I would be interested in participating in a small carp fishing tourney on the St. Lawrence. The idea would be to pit American carpers against the Canadian carpers for an international border battle of the carping world. One Canadian angler would be matched up with an American angler. I only had a little bit of experience fishing in tournaments but the prospect of fishing big water and strong fighting fish was the clincher for me. This one would be 48 straight hours of fishing and I was used to fishing 10-24hr long sessions. My dad was interested in going over as well and seeing what tournament fishing is like. He preferred to be a spectator instead of actually fishing in it. From March through to Late August, I acquired new tackle, a new bed chair, brolly, a whack-load of terminal tackle, bait (boilies, maize, chick peas, commercial groundbait & method mixes, jumbo corn, etc). Hoping to match my current custom Harrison carp rod, I got the last ACS MIA II carp rod from Big Carp Tackle (Based on a Harrison Chimera blank) - Being from Ontario, I never bought 2 of the same rod. In New York you're allowed to use 2 rods at once. 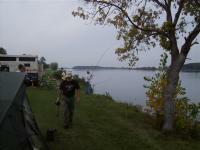 For the big items I had the items shipped directly to Ed’s Bait & Tackle in Waddington NY – The home base for the tourney. I booked a room at the Riverview Motel in Waddington a month in advance. I had a feeling it was going to be booked full later on - It turned out to be the case a couple days before the start of the tournament. Although it was a free tournament to enter and the pay-outs for the winners were not anywhere close to some of the big ticket events, our Canadian national carping pride was on the line! I was also really looking for a [email protected]$$ way to celebrate my B-day. 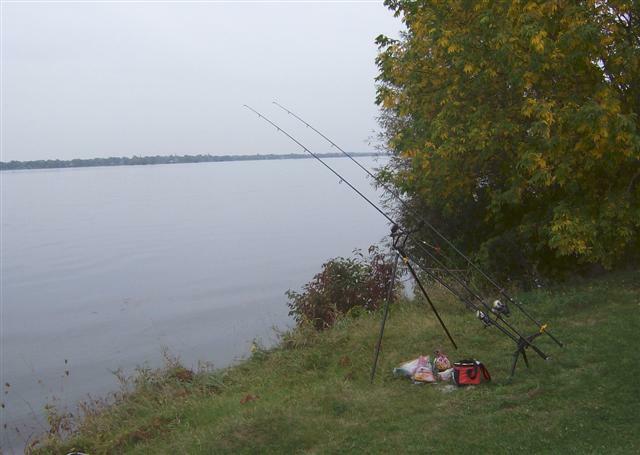 I couldn’t think of a better way to do it than on the shores of the St. Lawrence with an angry carp at the end of the line. We crossed over the border into Ogdensburg and stopped in at the Price Chopper to do some grocery shopping. We were unsure what food items would be allowed to be taken across the border so we didn’t bother bringing food with us. I still have no idea what the speed limit is like on Route 37 between Ogdensburg and Waddington. Most cars were going much (And I do mean much) faster than we were. We popped into Ed’s Bait and tackle for our NY licences and picked up a few items like 5-6oz lead weights and had Ed spool some fresh 65lb PowerPro on my Shimano Thunnus. Also picked up stuff that I had shipped over to Ed’s like my Brolly, bed chair and rod. No more sleeping on the ground with the earwigs and potato bugs for me. My dad and I drove around Waddington looking for areas which we might be fishing in at the tournament. We stopped at Whittaker Park and scouted out what the conditions were like. I had a 7’ bass rod with me along with a few soft plastic baits and tried to catch the 6-10 inch smallies which were cruising the shallows…I didn’t catch any. I also noted the places I wouldn’t want to fish due to the severe weeds. The view is just beautiful from this swim. At night all competitors who arrived early met up at Murray’s Old Irish Inn for dinner. There were raffle prizes and I won a big bag of Concept boilies + Concept super slimy bait dip (Bloodworm flavour). Ed didn’t think I was of age (which most people don’t) and gave my beer chip to my dad.LOL Carl from Team Canada, being the nice generous fellow that he is, gave me a spare Polaris float that he had in his box as a present. He definitely deserved the most sportsman-like award at the end of the tourney. We stayed at the Riverview of Waddington motel for the night. Great accommodations at a great price. I wasn’t the only angler to peruse their carp shop that day. Meeting at Ed’s bait shop for the peg draw and team matching: Team Canada plus one strange American spy (orange shirt) strategizing about the best tactics to use. I picked my spot from a hat and ended up choosing peg 4 along with my American competitor Amy. It was at Whittaker Park and one of the spots I didn’t want to fish because of the massive weed bed right in front. 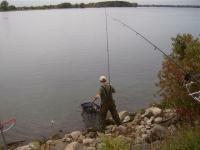 The weeds extended out to 30-45 yards from shore – whatever fish I would hook would have to be pulled though it. Bob said this was a big fish peg but thinking back I thought it was going to be a big pain in the @$$ to fish it (it was!). 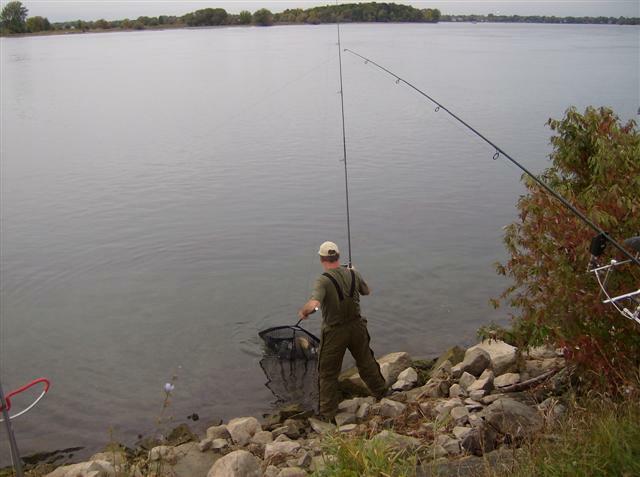 The rocky bank was steep and fairly hard to walk down which made it all that more challenging to fish. I arrived at the peg and set up. Hammercarp was to the left of me and further down along the bank, Steve (Carpsava) was to my right. The fishing was dead slow during the morning and afternoon. I think about 3 fish were caught from Whittaker park where I was at and none of those catches were made by the Canadians. It was an eye opener seeing the different types of techniques and baits each angler was using. Take this for instance. Also managed to see one angler’s rod + reel launch itself from the banksticks and fly into the water when the carp took his bait. I guess he forgot to put his baitrunner on or it failed to engage. As night came, I started seeing fish crashing near my baited spot 60-80 yards out. My alarm goes and I lean into the fish. It locks itself into the thick weeds and I try my best to haul it in. My rod guides were actually groaning while pulling in the fish. I finally managed to land one fish for Team Canada and I got to Christen my new rod doing it. Through the night and early morning I land 5 more to 23+lbs. Amy my teammate lost 1 fish but it did give her a good tussle before her hooklink unraveled. Amy slept most of the night but that was OK. 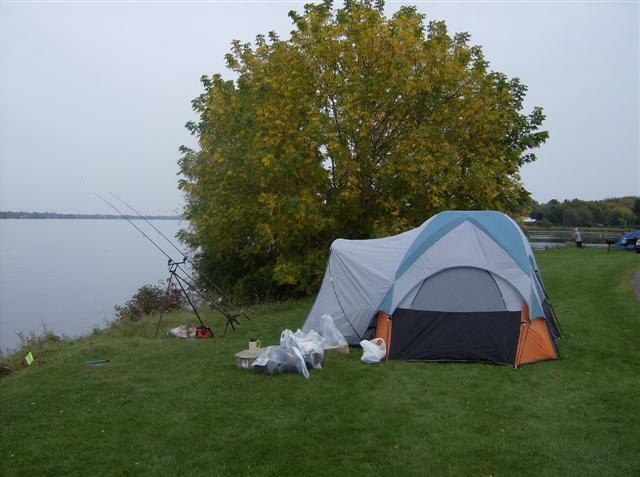 I didn’t have any problems netting the fish and I brought the fish to her tent for verification. I bet she was a little shocked to see a carp’s head sticking into her tent the first time I brought one over. Late morning and Afternoon were dead slow like the previous day. I think I saw 2 fish landed out of 10 anglers in that period. The guy who lost his rod the day before hired a pair of divers to retrieve it – In the end he got it back. Many of the participants came by to my peg to wish me a happy b-day. 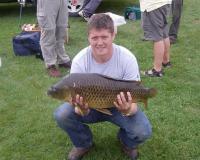 Here’s Steve’s (Carpsava) fish which he managed to land in the evening. The sun was still up and I have no clue why the background came out so dark. The action wasn't overly fast but looking at the other anglers, I was getting hits much more frequently albeit one every 40-90 mins or so (I actually didn't have a watch on). At 2:30am my alarm screams off and like before, I slowly gain line and winch the fish through the thick weeds. My dad nets it and I scale the steep bank to help him carry it back up. I did a second glance at the fish and realized it was a big mirror carp. Placed her on the unhooking mat and my dad and I could’ve sworn it was close to 30lbs. My other rod suddenly goes off and I’m into another fish. My dad puts the mirror into a fish sack with help from Hammercarp and I bring in a small common. We weighed it, released it and then un-sacked the mirror, weighed her and took pics. She was only 22 or 23+lbs. Certainly a new PB mirror for me by 1-2lbs. I'll have to confirm the weight when I get a copy of the score sheet. I was too tired to remember the exact weight. Close up. Holding her up was almost like holding a big glob of Jell-O. I’ve never caught a carp that fat or jiggly before. In total 8 fish came out during the night and early morning. Both nights I had a chat with Norm and Jeff from Team Canada at around 4am when the bite died down briefly. They were the only ones I could find close to me who were awake. Jeff loaned me a carp sack and gave me a bucket of maize when my stash was running low. No fish were hooked once the sun came up. I was in zombie mode with only 30min of sleep since 3AM Friday morning. Packing up was hard and news of a 29lber upstaging my 28l+ber was quite sad. It beat my fish by only a few ounces. Top Angling to Andrew who caught the biggun at the last minute. Here is Team Canada with the CanAm carp plaque. Everyone voted that I should keep the CanAm carp plaque at my house till next year’s event. It’s currently in my room waiting for the first tab to be shipped over and installed (Canada gets to Christen it ) . Congrats to both teams and all the participants who showed up to fish the event. Thanks to our hosts Bob (a Director of the Carp Anglers Group) and Ed (from Ed's bait and tackle) for setting up the CanAm carp cup and acquiring sponsorship for the event. For the month prior, I must have nuked their PM boxes with questions and they were always more than happy to answer all of them. Thanks to Andrew (AKA MACO Man) for donating medals, Rick walker for donating the beautiful pictures, the owner of Concept baits for driving all the way from Niagara falls with bait and bait dip that he donated and Jeff Vaughan for smuggling over some of his “secret bait” for me. There was also Mike Ripa and Becky who were great runners during the tournament who brought over anything you could possibly need. Have to thank my partner Amy for helping me out with the weighing and for being a great sport even with the slow fishing and bad weather we had. Lastly (but certainly not least), thanks to my dad for being my runner for the tourney. He cooked my meals, picked up stuff from Ed’s tackle shop when I was running low on spods and did a great job at netting my fish. He also paid for the hotel, gas and food bills as well . Without him, I doubt I would have had the results that I had. Sounds like it was a fantastic tourny! Congrats on your PB Mirror Carp too! Fantastic report Mike! That mirror was kinda gross...LOL. What did it fight like? It looks like it swallowed a bowling ball or something!! Anyhow, congrats on such a great event. You've made us proud here....and I feel privileged to have fished with you! I have to agree that mirror carp is well a bit different hehe. And not bad overall catch Mike. BTW nice bed chair who makes it and where can I get one? Thanks for the report, Mike. Been waiting for it since last Friday ;-) Theonlinekeepsack did a fantastic job to keep people like me updated. Great report Mike! Sounds like you guys represented Canada well. That mirror looks as if it swallowed some rocks. O man, you finally finished writing this!! Amazing write-up Mike, next year I am gonna make it for sure. That mirror looks very "European" lol if you know what i mean. We rarely see mirrors like that over here. The bedchair is made by D.A.M. Most places in North America stopped stocking D.A.M products. Best to get a quote on shipping before you order especially if you're going to ship it to Toronto. Thanks guys for your comments. I really appreciate it. During the tournament I had no clue where I stood compared to the rest of the competitors in the other park. One of my friends tried to send me a text but I got it after the awards ceremony. Throughout the entire tourney, Steve Conger wanted to know what my secret bait was. I had 3 in my arsenal and here are 2 of them. Hookbaits with a method mix. Lorne (Hammercarp) for being the most spirited carper at the tourney. Carl (IndyK) for being the most sportsman-like. Without a doubt, he deserved this fantastic prize. Way to go man, lots of big carp there. If only that mirror hadn't crapped and emptied out then MJL might have also won the biggest fish prize. That belly was so jiggly. Hmmm. enough room for bag of ice too? Absolutely fantastic write-up. (Ya been taking lessons from Moosebunk?) It was just like bein' there . . . . I could just FEEL the carp, wedging themselves in that weedbed. My Brit pal & Ron from Peterpatch went down to Long Sault this year . . . said it makes the carpin' up here pretty dull, by comparison. That may have been a lotta fun, but no doubt it was d a m n hard work too. Congrats for showin' 'em Canadians can fish carp too!! This is a really interesting report but the way, thanks for posting it. what an opportunity! congratulations MJL!!! That is a fantastic and in depth report. Lots of good photos as well! Congrats on the high placing, sounds like a real test of patience and endurance. It was a great read even though i don't fish for carp. Thanks for taking the time and effort in sharing this. I believe I was the first one on our side to sign for the CanAm carp Cup. I am very happy I did. The adventure was a first for me in many ways. My first trip to fish in the states and with an American as a partner, my first chance to fish carp in that magnificent river and my first 48 hr. tournament. I also aquired equipment over the summer in preparation for this event. A tent, sleeping bag, air mattress, a sun shelter( like I needed that with all the rain), other bits of kit including a wack of 4 oz. gripper leads,( thanks John ) new bite-alarms with remote and are you ready for this guys, a Fox Stalker pod with buzzerbars and two swing arms.. Yes I finally broke down and bought a pod. I had been speaking with Roger Holten about the tourney and we decided to partner up for the trip. We would be using Rogers van for the trip. I brought my stuff over to Roger's the night before we left and I think I over did it. I seemed to have a lot more junk than he did anyway. We left Hamilton about 9am Thurs. and right off the bat we had bad luck. I was driving and we got a flat on the highway while driving through Burlington. Roger put the spare on while I stood guard down the road a piece. We drove into Burlington and to a used tire joint and $50 later we were on our way. The rest of the road trip was routine and uneventful. We arrived and checked in to the Hotel, then went to scout out the various venues. While checking out Whittaker Park we saw that other site Bob and company out in a boat baiting the area up. We then joined Bob for a walk around the park while he pegged it. We all got together at the local watering hole for some eats and drinks and Neils from Concept showed up with what seemed like a wheelbarrow full of boilies and dips and other goodies. I won a big bag of boilies and some super slimey stuff in Cherry Insect flavour. Cool eh. Rick ( Carpdaddy ) proved to be the life of the party with his constant chanting U S A ! U S A !. The next day we met at Ed's bait and drew for pegs and partners I got peg #3 and a fine man Dave Lebeau for a partner. Off we went to meet the Larry. Roger dropped me off and went off to his peg. In short order I was set up and ready to go. Ya right. You didn't fall for that one did you? I kinda bumbled around with my new tent and pile of gear and then took a break and went over to visit Norm, who had the peg next to me on the west. BFA was on my east side. Norm was all set up and enjoying a nice cup of tea. Yes Len I said "nice cup of tea" and my tent was still flat on the ground. Better get back to business. I made it in time. I was set up and had one rod in the water on time. This is a picture of my new ( used ) pod. The first fish I saw caught was by my partner, which I dutifully netted. Here is Dave with his first of two fish. Here is Norm doing his thing. He makes it look easy. Which in that water it isn't. Finally a picture of some of the action to my west. I feel this was a great learning experience for me. ( I think you're suppose to say that when you blank) . But I did learn a lot. I learned what a great bunch of people the americans are. They were very organised and very thoughtful. You could have your meals brought to you right at the peg. Ed made sure all your tackle needs were met . This was a first class act all the way. that other site Bob and the crew deserve a big thank-you. They even brought me my net which I forgot in Roger's van without me even asking for it. We have big shoes to fill when it comes our turn to host this event. I learned to enjoy camping again. Which I hadn't done in years. I laid down in my tent for a rest and as I lay there I was smiling and I realised how happy I was , no cell phone , no traffic, no frantic demands "can I get my sign tomorrow?" There was just me, the carp, and the river. I had one run during the 48 hrs. The alarm screamed and I picked up the rod and engaged the reel and the fish did not even slow down. I swear. It peeled off line for about five seconds max. Then my hook link broke and that was it. Oh yes I learned to respect the river. It will blow 4 and 6 oz leads around like dead leaves in the autumn wind. The current will shift on you just when you think you have it beat and your bait is staying put and off it will go with your alarm beeping as the weight bounces along the bottom. The weeds there are very stong and thick they will stop your rig dead as you reel it in. I know some people call it the Larry but I will call it Mister Lawrence from now on. And I will be ready for our next encounter Mister Lawrence.